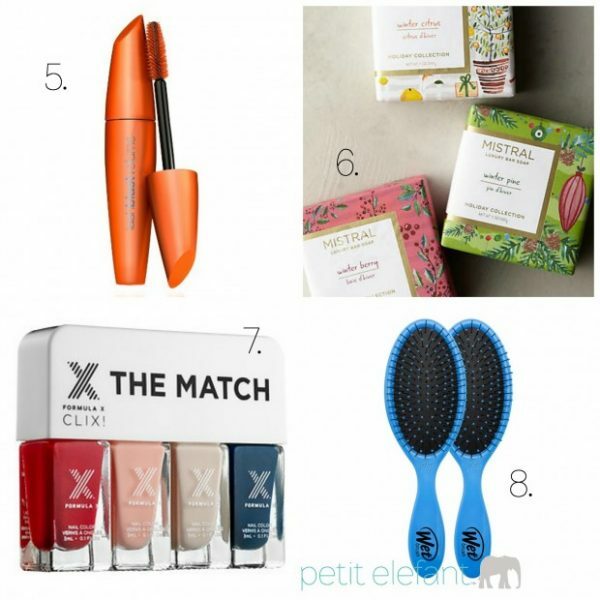 Beauty gifts are perfect for giving because they range from small to big, inexpensive to expensive, lipstick to hair styling, and everything in between. I don’t think I have one friend that doesn’t like getting new beauty products. Even girls that aren’t obsessed with makeup have a or few items they love to use. 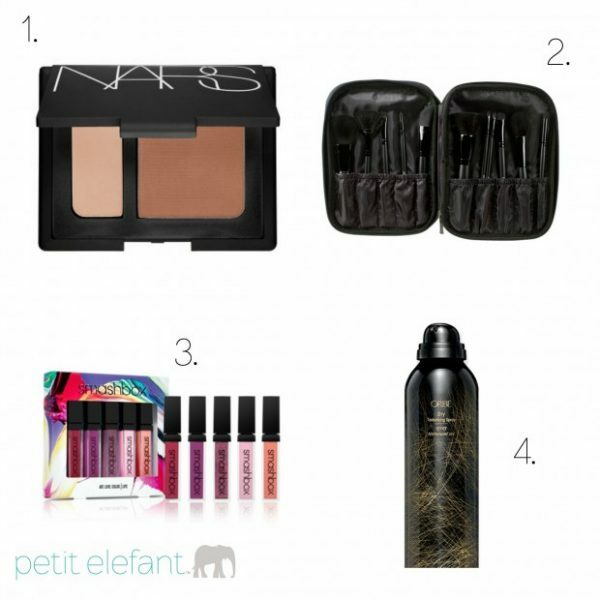 Cosmetics and styling tools make an ideal gift for just about any gal on your list. Here are some of our top picks from bargain brands to luxury labels. 1. Contour Blush: Contouring made easy with this gorgeous blush and bronzer duo from NARS. They’re kinds of the best. 2. e.l.f. Studio Brush Set: The most inexpensive but also high quality brushes out there. These are my fave, and so budget friendly. 3. Smashbox Lip Set: A glossy lip color for every day of the week! This is really a fabulous set. 4. Oribe Dry Texturizing Spray: If you’re going to splruge on one hair item, this is the one! Plus it smells incredible. 5. CoverGirl LashBlast Volume Mascara: The BEST mascara for under $7! Volumizes, lengthens, and lasts all day. 6. Mistral Holiday Bar Soap: These lovely soaps make perfect gifts or stocking stuffers with their beautiful packaging and heavenly scents. 7. Formula X Polish: The prettiest colors of nail polish that anyone would love, from traditional red to demure pink to a fun blue. 8. The Wet Brush: This is the ultimate beauty gift. It is a magical hair brush that can brush through any tangles, perfect for wet hair and gals with long tresses. I am a huge fan of Orbie. That product is great for texturing short hair.